4 February to 9 March 2013. Working with the idea of a 'writers retreat' COPY spent six weeks working from the Wild Pansy Press Project Space to produce new writing and reflecting on models of retreat and the influence of spaces and environments on writing and publishing produced within them. 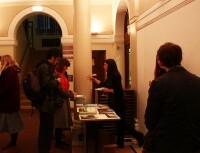 COPY produced a publication which was launched at the Artists Book Fair on 8th March. COPY also used the space to collaborate with Simon Zimmerman, Alison Andrews and Rachel Lois Clapham on the project ‘Field Guide to Writing’, which tied into the concerns of the project. Below: On March 6th COPY invited artist Barry Sykes to present his performance 'Hermit Movie Rethink' in the Old Mining Building entrance hall, adjacent to Wild Pansy Press Project Space. An adaptation of a lecture written for The Immersive Vision Theatre, a small planetarium set in the middle of Plymouth University, the work draws references to the site into a short multimedia lecture involving astronomy, astrology, cinema, animation, home movies, a tree, one joke and karaoke. Sykes' performance utilises the specific dimensions and details of the entrance hall, with it's columns and elaborate coving, through vocal and audio/visual projection. The performance accompanied the launch of Paradiso, a new Risograph printed guide for a writers retreat that weaves together Leeds University campus sites and everyday details relating to the Wild Pansy Press Project Space with idealised retreat locations and fictional spaces. Joanna Loveday and Charlotte A Morgan have spent six weeks working from the Project Space, researching models of retreat and reflecting upon ways in which spaces and environments influence the writing and publishing produced within them.